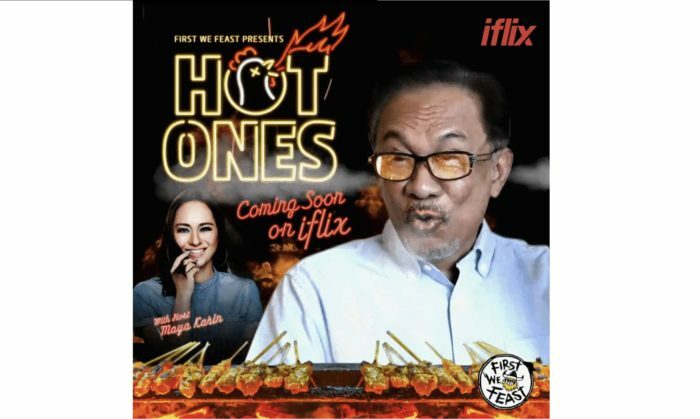 iflix has confirmed Malaysia’s Reformasi icon, Dato Seri Anwar Ibrahim, as the featured guest on the premiere of Hot Ones, the one-on-one interview show with a twist which will launch on 9 May 2019. The interview marks the second time iflix has localised Complex Networks’ format for local audiences, following the partnership of the two companies in June 2018. The first adaptation, Hot Ones Philippines, premiered exclusively on iflix in October 2018 and featured popular regional hot sauces including “The Last Dab” – a hot sauce that registers 2,000,000 on the Scoville heat unit scale. The format made famous by First We Feast sees both host and guest eat increasingly spicier chicken wings throughout the interview. In the iflix version, guests will feast on Malaysian specialty – satay – and each inferno-inducing bite is followed by a question solicited directly from Malaysians on social media to deliver the most raw, honest and hilarious reactions. Malaysian-German film actress, singer, and environmental activist Maya Karin will host the interview. “We have an unprecedented opportunity to create content on topics that interest and resonate deeply with Malaysia’s youth culture. We know this, because we’re putting the power in their hands to candidly confront topics with a Malaysian political heavyweight and an enigma of a character such as Ibrahim,” said Mark Francis, iflix global director of original programming. “Our social media-savvy audience is enormous and hugely influential, leading the way in defining and shaping trends and innovation in media and culture. This exclusive iflix original production represents a significant step forward, combining world-leading formats with cultural relevance and local flair,” he added. Chris Schonberger, Hot Ones creator and First We Feast GM, said it is “fun” to see its “unique interview concept spread to other countries and personalities through our partnership with iflix”. “We’re thrilled to kick off the Malaysian version of Hot Ones with someone of DS Anwar Ibrahim’s stature and look forward to continuing to push diverse conversations internationally,” he added. WPP group has been hired to spearhead the Bank of America Merrill Lynch's bullish push into Asia, with The Brand Union to act as l..
AsiaMX (Asia Media Exchange), a Singapore-based premium cross-media monetisation service provider is has closed of its angel inves.. Representatives from the Facebook, Google and Twitter were grilled to determine their reliability as partners in fighting fake new..
To get on the right track for loyalty programme success and appeal to customers' heart, ICLP's Mary English suggested retailers co..